Experiencing a throbbing pain in forehead, cheekbones, and behind the bridge of the nose? It may be a sinus headache. Inflammation and pressure in sinus cavities cause this headache. Usually, sinus cavities produce and drain out the mucus. However, the sinus cavities get inflamed during a bacterial infection or allergy, which restricts the outflow of mucus. This creates pressure and congestion in the sinus cavities resulting pain. Constant pounding pain, fever, swelling and tenderness in face, stuffy nose and nasal congestion are some of the sinus headache symptoms. Usually, the pain gets severe with movement like lying down or bending over. It’s even worse in the morning due to mucous collection throughout the night. The right solution to control the headache is to reduce the inflammation of sinus passages which eventually drain out the mucus. Instead of popping antibiotics, get relief with simple home remedies like hot and cold compress and steaming. Suffering from sinusitis or recurring sinus infection, then try these remedies to treat it at home. 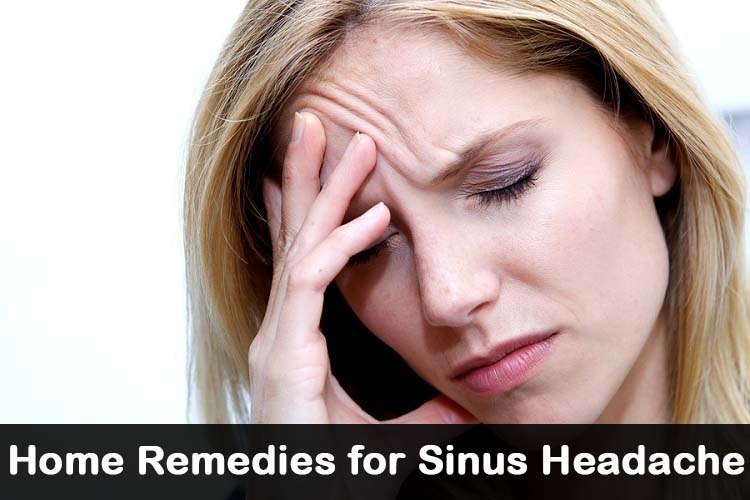 Here is an assortment of various home remedies you can try to get relief from sinus headache. One of the best home remedies for sinus headache is an alternate hot and cold compress. When moist moderate heat is applied on the sinus region it eases the pressure and loosens the thick mucus. Whereas when cold compress is applied, it provides relief from the pain by constricting the blood vessels in the sinus region. Take some water and heat it. Make sure the temperature is warm enough such that your facial skin can handle it without any burns or other discomfort. Soak a wash cloth or face towel in this water and wring out the excess. Fold and place the towel on your face covering the sinus region (forehead, nose and cheeks). Leave it for 3 minutes. Remove the face towel and soak it in cold water. Wring out the excess, fold and place on forehead for 30 seconds. Repeat the process 2 – 4 times in a day. Taking a facial steam helps to moisten the nasal passages, clear the blocked nose and open up the congested sinus cavities. This eventually helps you drain out the mucus and breathe easily. It is one of the instantly effective home remedies for sinus headache. Take some water enough for a facial steam and bring it to boil. Once the water is boiled, remove from the flame and add few drops of essential oil (optional). Lean forward towards the bowl containing hot water. Make sure your face is at least 30cms away from the water to avoid burns on your face. Cover your head with a towel or bedsheet in such a way that the steam vapours don’t escape. Now breathe through your nostrils and feel the steam going in them. Release out from your mouth. Repeat this for 5 counts. Now reduce the inhaling and exhaling to 2 counts. Continue doing this for 10 minutes or until the water is steaming. Make sure to blow your nose during and after the treatment to remove the mucus draining. Continue doing this for 1 to 2 minute or until you can tolerate. Remove the towel and relax to feel calm and cooler. Repeat the process again one more time. Inhale the vapours of hot tea or soup to stimulate a steam treatment when you are at work or outside. You can repeat this treatment once in every 2 hours for relief. At any point if you are not able tolerate steam or feeling burning sensation then remove the towel so that your face can feel calm and cooler. In the case of children, seniors and pregnant women, special care should be taken while inhaling steam to avoid burns. Neti pot increases the mucus drainage, reduces the pressure and inflammation in nasal passages. In this process, you will irrigate the nasal passages with a saline solution which cleanses the nose and sinus cavities. Once the mucus is drained out, the sinus pressure and headache will automatically reduce. Take a cup of lukewarm water which is distilled, sterile or previously boiled. Add 1/2 teaspoon of salt into it and stir well until it dissolves. Fill the Neti pot with the saline solution. Now tilt your head over the skin at 45-degree angle. Place the spout of the Neti pot into one of your nostrils. Gently pour the solution into nostril carefully. The fluid starts following though your nasal cavity and comes out through another nostril. Sometimes it may run into your throat. Don’t worry, if it happens jut spit it out. Blow your nose to remove any remaining liquid. Now refill the Neti pot and repeat the process on the other side. As per some studies, it is said that people have achieved complete relief using Neti pot treatment daily. Once the symptoms are reduced, it can be repeated 3 times in a week. Alternatively, you can take bulb syringe without needle and irrigate your nostrils using it with saline solution. Do 2 sprays on each nostril for relief. Note: Rinse the irrigation device or Neti pot every time after using it and leave to air dry. The cineole component present in Eucalyptus oil holds anti-inflammatory properties which reduce the inflammation. Eucalyptus is also rich in decongestion properties which reduce the mucus production which reduces the congestion in the sinus cavities. Take hot water in a bowl enough to use for steam inhalation. Add few drops of eucalyptus oil into it. Bend towards the hot water and cover your head with towel such that no steam escapes. Make sure there is enough space between you and water to avoid burns. Inhale and exhale the steam. Do this for few counts. Dilute few drops of eucalyptus oil in 2 teaspoons of coconut oil or olive oil. Rub the mixture gently on sinus regions which include areas around nose, forehead and cheeks to get relief from the sinus pressure and headache. Tip: Take a clean handkerchief or cotton pad and pour few drops of eucalyptus oil on it. Smell the eucalyptus placing the handkerchief near the nose. You can smell it throughout the day whenever required. To a bowl of hot water, add few drops of peppermint oil. Take a steam of this solution for few minutes. Repeat the process daily whenever required until you get complete relief. Alternative: Add few drop of peppermint oil in any carrier oil (almond oil or jojoba oil). Rub this mixture gently on the sinus regions i.e., nose, forehead, temples and cheeks. Tea tree oil contains antimicrobial, antiviral, anti-bacterial and antifungal properties. It can not only provide relief from sinus but also treat the root cause like microbial infection. Therefore, it is one of the best natural remedies for sinus headache because it helps in getting rid of it completely. Add few drops of tea tree oil to hot water and inhale the steam. Repeat daily whenever required until you get complete relief. Process 2: Try this process if you can withhold the strong nature of tea tree oil. Avoid if you cannot. Add 1 drop of tea tree oil on a Q-tip. Swab out the inside of nasal cavity using it. Process 3: You can try this process whenever you are outside or in the office. Add a drop of tea tree oil on a cotton ball or Q-tip. Inhale the smell of it filling the aroma into your nose. Note: Due to blocked nose, you may not feel the smell of tea tree oil but the air containing tea tree oil will provide relief by slowly clearing the blocked nose. Gingerol component present in ginger holds anti-inflammatory properties which reduce the swelling. The pain-relieving properties of ginger provide relief from the pressure and congestion. Slice a ginger and add it to a cup of hot water. While sipping the ginger tea, inhale the vapours coming out it. Eat the ginger slices as well. Strain them if you don’t want to eat them. Consume 3 – 4 cups of ginger tea in a day until you get some relief. Blend ginger with enough amounts of water to make a paste. Using a facial brush or fingers apply it on the forehead. This should provide relief within 30 minutes. Alternatively, Massage few drop of ginger oil on the sinus regions to get relief from the sinus headache. For effective results, you can include ginger in your daily cooking. Cinnamon contains antibacterial, antiseptic, antiviral and anti-inflammatory properties. It reduces the swelling which open the blockage in nasal passages. Consumption of cinnamon boosts your immunity which protects you from viral and bacterial infections. In a bowl, combine 1 tablespoon cinnamon powder, 1/2 teaspoon of sandalwood powder and enough amounts of water to make a paste. Using a brush or fingers, apply the paste on your forehead. Leave the application for 5 – 8 minutes and wash it off with water. Repeat the process frequently until you achieve the results. Alternatively, you can exclude sandalwood powder if you don’t have it handy. Bring a cup of water to boil and add a cinnamon stick. Let it steep for 10 – 15 minutes and consume it. Inhale the vapours from the cinnamon tea for extra relief. Alternatively, you can a pinch of cinnamon powder to teas, coffee, milk or any other beverages. Alternatively, you can combine 1/4 teaspoon of cinnamon powder and 1 tablespoon of honey. Consume this mixture daily for at least 3 days to get relief. To hot water, add 3 – 5 drops of cinnamon oil. Cover your head with towel, bend towards the hot water and inhale the steam. After few minutes of steaming, remove the towel and relax. For extra effectiveness, add thyme and clove essential oils. Holy basil also known as tulsi contains eugenol, campehe and cineole components. They help to clear the congestion and inflammation of the sinuses. The antiviral properties present in fight with bacteria or fungal causing the infection. The soothing effect of it provides relief from headache. Wash 10 basil leaves. Wash and peel 1 inch ginger. Using a mortar and pestle, crush basil leaves, ginger piece and 10 pepper corns to make a paste. Bring a cup of water to boil and add the ground paste into it. Simmer until the amount reduces to half of its actual quantity. Strain the solution and add sugar candy for taste. Drink it on an empty stomach. Repeat drinking this Ayurveda remedy daily. Apart from that, you can also drink it 2 hours after your meals or whenever required. Note: Avoid taking bath or expose yourself to cold after drinking this Ayurveda sinus headache home remedy. Add few drops of tulsi oil to hot water. Inhale the steam from this solution by covering your head with towel. After few minutes, remove the towel and relax. Apple cider vinegar contains anti-bacterial and antifungal properties which fight with the bacteria or fungus causing infection. Its anti-inflammatory properties reduce the inflammation which helps in draining out the mucus. Now remove from the flame and let it sit for a minute. Cover your head and inhale the vapours through nose. Your nose may sting a little but don’t worry. It will next clear the mucus and slowly drains it out. After few minutes of inhaling and exhaling, remove the cover and relax. For extra soothing effect, add peppermint oil. Combine 2 cups of tomato juice, 2 – 3 garlic cloves, 2 tablespoons of lemon juice and hot sauce (as much as you can handle). Heat this mixture in a saucepan or in a microwave. Sip slowly and inhale the fumes. Drink 2 – 3 cups of tomato tea in a day. Alternatively, you can make a tea of V8 juice, 2 garlic cloves, and juice of 2 lemons, 2 tablespoons of honey and a pinch of cayenne pepper by following the same process as above. You can substitute tomato juice with V8 juice, vegetable juice or tomato soup. If you don’t have fresh garlic you can use garlic salt or dehydrated garlic. You can substitute hot sauce with cayenne pepper, horseradish or black pepper. Though it sounds strange, pepper is also helpful in clearing the nasal passages and draining out the mucus. They also provide relief from the inflammation. Here are few ways of using for sinus headache relief. Brew any herbal tea of your choice like ginger, chamomile or cinnamon. Add a pinch of cayenne pepper into it and consume it. To your broths, soups and gravies, add a good amount of chilli pepper or black pepper powder and consume it. If you are strong enough to handle the taste of jalapeno pepper then chew a piece of it. Though initially tears come from your eyes, next you will drain out the mucus. People who like sushi can try Wasabi, the spicy topping give temporary relief from the sinus pressure. Consumption of hot salsa, hot wings, horseradish or any other spicy foods help in draining out the mucus. Note: Never try these with kids as they cannot withstand the strong taste of peppers. The properties of different ingredients used in this process provide relief from the inflammation, pain, congestion, infection and pressure in sinus cavities. In a saucepan, add 1/4 cup each of lemon juice and apple cider vinegar. Simmer this mixture on heat. Add 3 tablespoons of honey, 1/2 teaspoon each of cayenne pepper, ginger powder and cinnamon powder. Remove from the flame, let it cool down and store in an airtight container in cool dark place. Consume 1 – 2 tablespoons of this mixture daily. For kids, use a very less amount of this mixture. Note: Shake the bottle well before consuming as some ingredients may have settle down to the bottom. A gentle shake will incorporate them again. For more effective results, you can warm up the mixture before consuming. Other than remedies using ingredients, here are some of the things you can incorporate in daily life to get relief from sinus headache. Sleep with your head elevated: While you are relaxing or going to sleep, elevate your head by placing few pillows beneath the head. This helps to breathe easily, drain out the mucus and avoids pressure build up in the sinuses. Applying a menthol vapour rub under the nose while sleeping also helps in clearing the nasal passages. Hot Water Bath: Taking a long bath with hot water also works the same like steaming. The warm and moist air created while bathing in hot water helps in clearing the nasal passages and reduces the sinus pressure. Make sure the temperature of water enough hot that your skin can handle to avoid burns and other discomfort. Avoid spending too much time in hot showers as it can make you nauseous. Humidify your interiors: Moist air may ease the congestion, pressure and sinus pain by reduces the swelling and clearing the nasal passages. Here is how you can moist the air in your interiors. Place a humidifier in your bedroom. This helps people who cannot sleep due to the discomfort caused by sinus headache. Keeping your nasal passage and sinus moist is very important as dry air can irritate them more. Humidifiers are essential important during winters as the air is very dry during the central heating in your home. Place a hot bowl of water any corner of bedroom this helps in warm up and moisten the air. Make sure you won’t accidentally trip on it. Keep you humidifiers clean as they can easily get mold and dust which can increase the sinus infection. Good Massage: Applying gentle pressure on the sinus regions (forehead, bridge of the nose and cheek bones with index and middle fingers helps get relief from the sinus headache. Use any essential oil while massaging for extra relief. You can also ask a friend for a gentle massage while you are sit back and relax. Fluid Intake: When the nasal passages get congested, the tissues of the passage get inflamed and cannot drain out the mucus. Drinking plenty of fluids will decongest the nasal passages by thinning out the mucus and reduce the inflammation. Water, hot teas, soups, lemonade are the best in clearing up the mucus. You can opt for fruit juices as well but as they contain fructose, you will increase the calories unnecessarily. Stretch Up: Exercising increases the heart rate just enough to break sweat which helps to clear the nasal passages. Aerobics, running or cycling for 15 minutes or even moderate exercise like brisk walk can help. Breathing Exercise: Deep breathing exercises help in draining out the mucus and ease the sinus headache. All you have to do is to inhale slowly through nose and exhale slowly through mouth. Doing this for few minutes relaxes the tense muscles contributing to headache. Sit back and relax: Taking rest also helps in getting relief from the sinus headache. Though sinus headache is caused by inflamed sinus cavities, stress and tension can makes the pain worse. Load Up with Vitamin C: Vitamin C is rich in antioxidants which boost the immune system and fight with infection in sinus cavities. Foods that are rich in vitamin C are lemons, oranges, kiwi, pineapple, broccoli, strawberry, gooseberry, pomegranate and cauliflower. Pop couple of mentholated drops to get relief from the congestion. Though this doesn’t provide results, it can provide some relief. Allergy Proof Your Home: Allergies and bacteria can make the infection worse. Make sure the environment in home is free of dust mites and other allergens. You can install an air filter system, keep pets out of bedroom and use bedding with allergen proof barriers. Stay away from alcohol and smoking: Smoking and consuming alcohol can increase inflammation and prevent them from draining which contribute to sinus headache. Stay out of polluted air: As pollutants and allergens worsen the inflammation and restrict the draining of mucus, it is better to avoid strolling in areas with dust, smoke and other pollutants. Foot Bath: It sounds weird of taking a foot bath for a sinus headache but it actually works. Soak your feet in warm water and keep a cold compress under the neck and relax. This helps to relax the muscles and ease the headache. When you are suffering from sinus headache, avoid using electronics and gadgets as the rays and light (no matter how low it is) coming from it can increase the pain. Avoid sudden change in the temperatures. When you are out in the sun for long time, don’t quickly move into air conditioned environment immediately and vice versa. Give some time to your body to adjust the temperature to normal room temperature then you can increase or decrease the temperature of the room. Have you tried any remedy mentioned above in the article? If none of the remedies worked, or if you are having severe pain, swelling in face, confusion, fever or stiff neck then consult a doctor right away. a better acupressure point is a set on the face. One on each eyebrow and the cheekbone there are notches. Massage these four points with thumbs and forefingers by pushing up on the relaxed (forward flexed) head. They are more sensitive than you think. Enough pressure to be a bit uncomfortable but don’t hurt/bruise yourself. The headache you experience before periods is because of the sudden drop in estrogens level. The drop is actually normal. This headache is described as menstrual migraine. Ginger tea works best for it. You can also apply diluted peppermint oil on forehead for relief. Don’t forget to drink plenty of water. Fresh ginger root is helpful. If it is not present then you can use ginger powder. Both of them are easily available in supermarket. Ginger works on cynus headache? Yes. As ginger has anti-inflammatory and pain killing properties it provides relief from sinus. Does putting a warm wet cloth over the face works on cynus headache? Hi dear, I tried ginger water steam and drink I got good relief I’m sure this information is good thank you so much. Choose any method mentioned in the above article as per your convenience. Try it out regularly. Apart from that consume soups, bathe with warm water and take a steam at least one in day. The tea tree oil swab stung really bad and i had to rinse it out because it felt like my nose was on fire. Could that be because i have been blowing my nose a lot? Dilute tea tree oil in enough amounts of water and try the process. If the diluted application has caused unbearable burning sensation then try a different remedy like steaming with diluted tea tree oil. The article doesn’t mention dilution. If you can handle the strong nature of tea tree oil then dilution is not a compulsion. If you cannot handle, then you can dilute it with some water. While in Arizona, I grabbed a sinus headache relief pillow/sock, to warm in the microwave and place on my sinuses. It included several herbs and worked like a dream. Long story short, I’m trying to copy the recipe to get some relief. Maybe sage, lavender, wormwood, chamomile, and eucalyptus? Question is how much? May be you can add 1/4 cup each dried sage, lavender, wormwood, chamomile and eucalyptus herbs. How long one can have sinusitis? how much time it takes for complete treatment from sinus??? The time period of sinusitis to clear depends on the severity of it. If you follow the remedy regularly, you can observe improvement in a week. I tried the cinnamon paste remedy, without sandalwood paste, and it caused a lot of burning sensation on the forehead, cheeks and nose. I ended up washing it off within minutes. Is there a way to use this remedy without the pain to the skin? As you have applied cinnamon directly, it might have caused the burning sensation. It is better to combine cinnamon powder with any other ingredient like sandalwood paste. I use a c pap machine is this what be causing my sinus problems. Last three day had bad sinus infection given Dedron for headache which has helped a lot. I got a Ct scan due headaches they gave be these high pain medicine that didn’t help at all.